Jen and I visited San Sebastián on our first holiday together, way back in 2010, when we’d only known each other a few months. It was only a brief stop en route from Biarritz to Bilbao, but we absolutely loved the town and vowed to return. So when our Australian friends, Nicki and Mat, told us they were going to be in Europe for the summer a plan was formed to meet up for a week in San Sebastián. The run up to our trip was more relaxed than Owen’s first foreign holiday – for a start our airline didn’t go bust a few weeks before we were due to fly! We must have been excited about the trip as we all woke up naturally before the alarm and were even early setting off for the short drive to Birmingham airport! Owen was on his best behaviour, and without any stress or rushing we were on the plane bound for Biarritz. Or at least we thought we were… About half an hour into the flight the captain announced that there was a problem with the plane and that we were on our way back to Birmingham! Fortunately Flybe were pretty good about things and we were back on a spare plane and on our way less than two hours after the announcement. By this time Owen was due for a nap, and managed to fall asleep as soon as the engines had started and slept through the take off and a good chunk of the flight. This second flight was uneventful, Owen was well behaved, as were the large group of school kids we’d spotted at check-in that I’d been dreading having on our flight. The delay wasn’t really a problem, as Nicki and Mat weren’t due to land until the early evening, so we had less time to hang around in Biarritz. Just enough time to pick up our hire car and pop to the supermarket for some essentials (and a photo with the tank of crabs). I’d never realised that French supermarkets all shared the same smell, but as soon as we walked in, I was taken back to family trips to visit relatives in France as a child. The flat itself was really nice and was even equipped with some toys for Owen to play with. After unloading the car, we headed out for pintxos (Basque tapas) near the Airbnb. The bar was next to a playground, and all the local kids seemed to be out playing, so it was ideal for Owen to stretch his legs after a whole day of travelling. We all spent a lovely evening catching up. 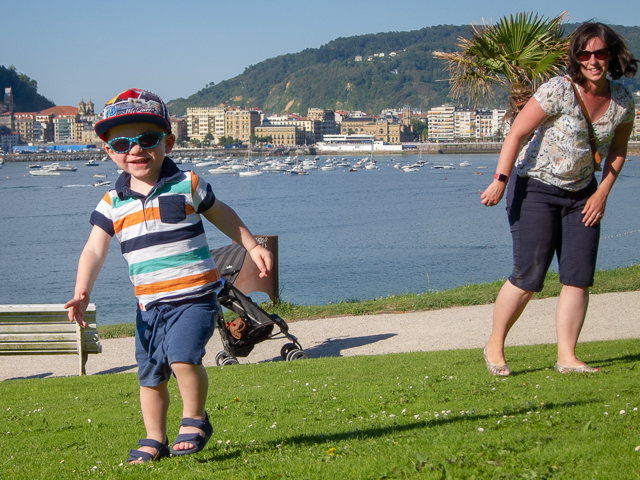 Nicki and Mat started our first full day in San Sebastian with a run to explore town, whilst Jen and I got Owen ready for the day. After breakfast we went out to explore the city centre, a 15 minute walk down the river from our Airbnb in the Amara area of town. Rather than head into the old town we crossed the last bridge and visited Playa Zurriola Hondartza – the surfing beach. We had planned to just have a look, but Owen really wanted to have a play in the sand and a paddle in the sea! The sea was colder than I was expecting, considering how warm it was on the beach, but it still made me want to go for a surf! After washing the sand off our feet we crossed back over the river and walked round the headland to the aquarium. All the running around on the beach must have tired Owen out, as he fell asleep in the pushchair, only waking up when we stopped outside an ice cream shop. We escaped the midday heat by wandering round the narrow streets of the old town, stopping for a pintxos lunch in a cafe. As we were eating our lunch the ice cream shop next to the cafe opened – so of course we had to get an ice cream for dessert! From the old town, we walked past the harbour to Playa de la Concha, the main town beach. We hadn’t planned on stopping at that beach either, but Owen really wanted to try out his new bucket and spade, so we had an hour on the beach, digging holes and building sandcastles. The sea was still cold at Playa de La Concha, but unlike the Playa Zurriola Hondartza, it is in a sheltered bay, so the sea was much calmer for swimming. Once again all the excitement of the beach tired Owen out and he was asleep by the time we got back to the Airbnb. We had only popped out for the morning to explore the town, but ended up spending the whole day out! Mat and Jen made a great tapas dinner and we just spent the evening chilling out. The next morning dawned overcast, however the surf forecast for Zurriola beach was looking good – the best conditions it would be during our stay. So when Nicki and Mat got back from their run, we had breakfast, then went down to the beach. I hired a board and wetsuit from Bluemotion surf shop – they had changing rooms and showers downstairs, which was very useful. The surf conditions were a lot like Croyde at low tide – best described as punchy. I got pummelled a few times, but eventually found a slightly mellower part of the beach and managed to catch a few decent waves. Owen was mostly digging holes on the beach, but did come down to where I was surfing to watch for a little bit. After surfing, we picked up some supplies for a picnic and took a boat trip around the bay and over to Santa Clara island, which is in the middle of the bay over from Playa De La Concha. We climbed up the hill and had our picnic before exploring the island. It was pretty quiet – I think there were more little seagulls, butterflies and little lizards than people there. We got back to the dock just as the boat was pulling away, so we retired to the cafe, then the beach to wait for the next boat back to San Sebastian. It was late afternoon by the time we got back to the Airbnb, time for a quick shower and nap before heading out for pintxos. On the way into town we came across a big protest, I assume about the “wolf pack” being released. After some wandering, we found a pintxos restaurant that looked suitably child friendly. It turned out to be a bit strange, but the food was lovely, albeit not as substantial as we were expecting, Owen started to get fed up in the restaurant, so I took him for a walk and checked out the pintxos at nearby bars. I spied some interesting bacon/egg pintxos, so had to take a couple of them for the walk home. These were probably my favourite pintxos of the week. Looking at my iPhone later that evening, I had managed to set an all time steps record of 23,363, beating my previous record which had been set in Las Vegas! Friday I had a days mountain biking booked with BasqueMTB, which is a whole other blog post! On Saturday we went to Bilbao, which is just over an hour’s drive from San Sebastian. We started off with a walk along the river, on the opposite bank to the famous Guggenheim museum. We found a playground for Owen, and made our plans. We didn’t think Owen would appreciate the art in the museum, and Jen and I had visited on our previous trip, so Mat and Nicki went off to the museum on their own. We stayed at the playground for a while, then went for a walk around town to try and find somewhere for lunch. Once again lunch seemed a bit confusing, but was very nice. Jen and I ended up with a whole grilled turbot to share, which the waiter filleted for us at the table. It was a bit posher than we were aiming for, but the food was lovely. After lunch, we met Mat and Nicki at the “Puppy” sculpture outside the Guggenheim. We all went for an ice cream, before checking out the sculptures on the outside of the museum, including the new Joana Vasconcelos “Solitaire”, which is a giant engagement ring made from gold alloy wheels and whisky tumblers. Of course the whole building itself is also a work of art! 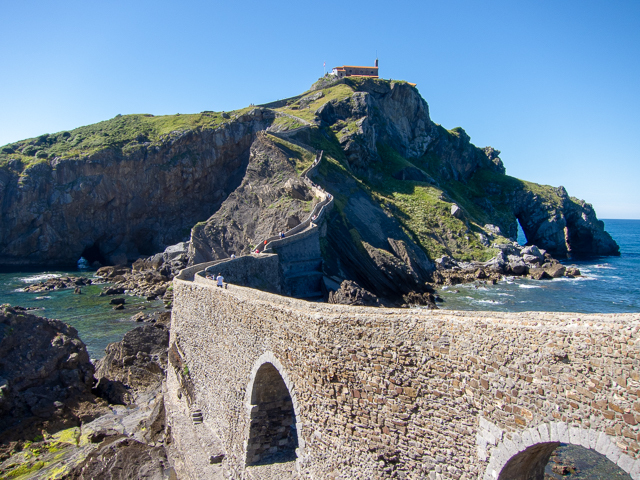 From Bilbao, we followed the coast road to San Juan de Gaztelugatxe, an island hermitage accessed by 241 steps. I’d originally seen it on BasqueMTB’s bike hire page and thought it looked like an interesting place to visit, and it didn’t take much to convince Nicki and Mat either! We were prepared for the 241 steps to climb to the hermitage, but hadn’t been expecting the two kilometre walk down a steep hill to the bottom of the steps. The walk down was hard work, especially in the heat and with Owen in his pushchair. For the climb up to the hermitage and small church, we took Owen out of the pushchair and started off with him on my shoulders. I must have looked like I was struggling a bit, as Mat offered to take him the rest of the way to the top. The church at the top is dedicated to John the Baptist, who allegedly visited back in the day. Our visit was the day before Saint John’s day, when a big pilgrimage had been planned. It is said that ringing the church bell three times will cure you of your ills and ward off evil spirits, so of course, we each had to ring the bell three times! What ringing the bell didn’t do, was make the walk back to the car any easier! Going back down the steps with Owen on my shoulders wasn’t too bad, but the climb back up to the car park was brutal and we were all ready for dinner by the time we got back to the car. The plan had been to call in at Mundaka, a famous surfing town just down the coast, for some food. However, when we got there the whole town seemed to be out celebrating in the street, so we figured that we would carry on as the restaurants would either be closed, or about to be very busy! We stopped in Guernica instead, a town that Jen had wanted to visit anyway. We walked into town and found somewhere to sit outside for dinner, I went for the speciality, which was a bun-less burger, with peppers. While we were waiting for our food, another protest march came past. I’m not sure if it is just a coincidence, of if they just have a lot of protests in Spain! The food was good, although I spent most of the meal wrangling a wriggly Owen. On the drive back to San Sebastian, we noticed a lot of bonfires burning, which we later learned were related to the festival of San Juan. It was quite a sight seeing the smoke rising from bonfires along the coast. 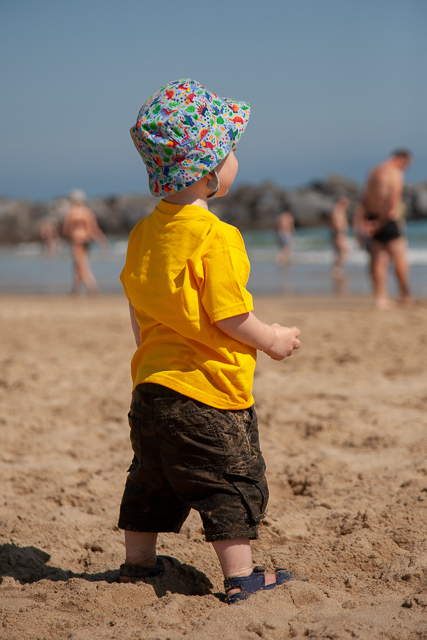 After spending most of Saturday in the car, we thought we should do something Owen wanted to do on Sunday – so we went down to Playa de La Concha to build sandcastles and play in the sea. It was a lovely warm day, and the beach was already busy by mid-morning, but we managed to find a space to lay our towels. On our previous visit, I’d looked at the pontoons floating in the bay and thought it would have been cool to swim to one of them, so this was my chance! The water was cold at first, but lovely once I was in. I was surprised to see fish swimming close to the bathers, including some fairly big fish. The pontoons were only a few hundred metres from the beach, it was an easy swim. I climbed onto the pontoon, bomb dived in, then swam back to the shore. By the time I got there, the beach looked busier, probably a combination of more people arriving at the beach and the tide coming in. I dug holes and made sandcastles with Owen, then took him down to the sea for a paddle and to look at the fish. Owen didn’t seem too convinced by paddling in the sea, possibly as it was colder than in Cyprus last year. We came back from the beach, with the idea of Owen having a nap, but he was too excited, so it was much later in the afternoon before Owen fell asleep. Jen took the opportunity to head out and explore on her own, whilst I caught up on blogging and had a nap myself. We went out for dinner by the cathedral, calling in at the park on our way home. After the excitement of the previous evening, Owen had a lie in, so it was already past 11:00, when we set off towards the aquarium. We had been saving the aquarium as a rainy day activity, but we were lucky with the weather all week, so we saved it for the last day, despite the glorious sunshine. It was only a small aquarium, but Owen enjoyed looking at the fish, especially the octopus. From the aquarium we walked into town to hunt down some pintxos for lunch. 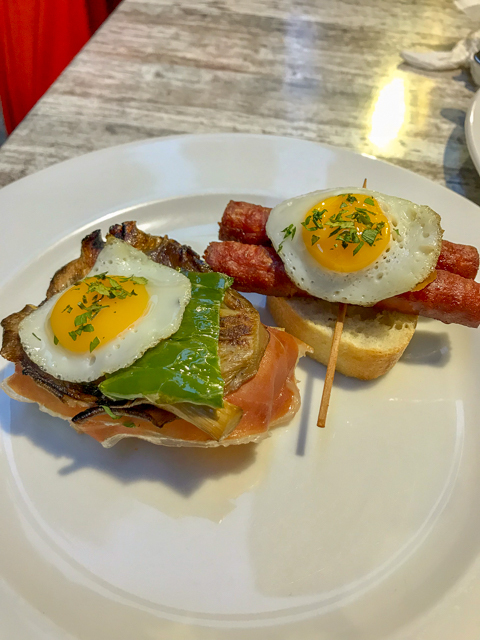 We were successful – I think we found the best pintxos of the trip in the old town. We followed that up with the best ice cream of the trip at Gelateria Boulevard. I also treated myself to a pair of Havianas flip flops, as with all the walking on this trip my feet had been cut to shreds by my old pair. Once again we went back to the Airbnb for a siesta. The plan had been to visit the Iguelda theme park, overlooking the town, but Owen was fast asleep and we ran out of time. Instead, we walked along the promenade to the Miramare Palace gardens. The beach was so busy, my theory was that the locals were calling in after work, as the weather was so good. We had a lovely time chilling out in the gardens, watching the world go by. Not getting covered in sand was a result too. We walked back along the beach to town, then to a bar near the Airbnb for drinks and pintxos (and a run around on the playground for Owen). I am always a bit sad waking up on the last day of a holiday, but also looking forward to getting back to Coventry and all the comforts of home. The trip wasn’t ending for everyone though – Nicki and Mat were moving onto the next stage of their trip! They are running across the Pyrenees, on the GR10 trail. 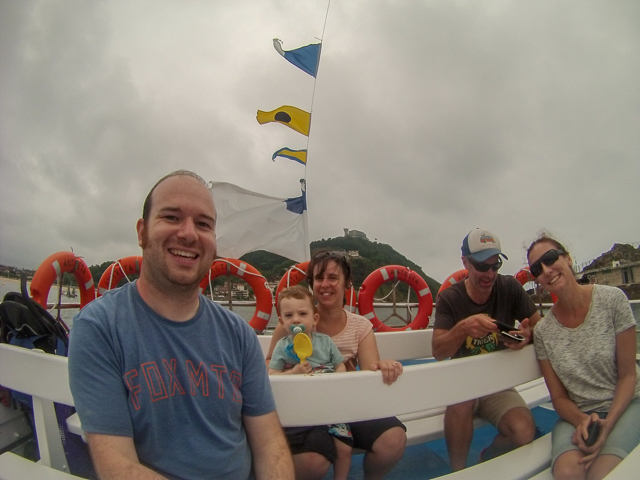 You can follow their blog and be sure to check out Nicki’s San Sebastian post. On our way back to the airport we dropped them off at the start point – in Hendaye, just over the border in France. As we had a bit of time before needing to be at the airport we parked up on the promenade and found a cafe/boulangerie for second breakfast. The flight back to Birmingham was uneventful, Owen was well behaved and slept for the last hour, including the landing! It was strange getting home and the weather being as nice as it was on holiday. It made me want to go to the beach, then call in at a bar for pintxos, but unfortunately you can’t do that in Coventry – it was only the weather we had brought back from San Sebastián. 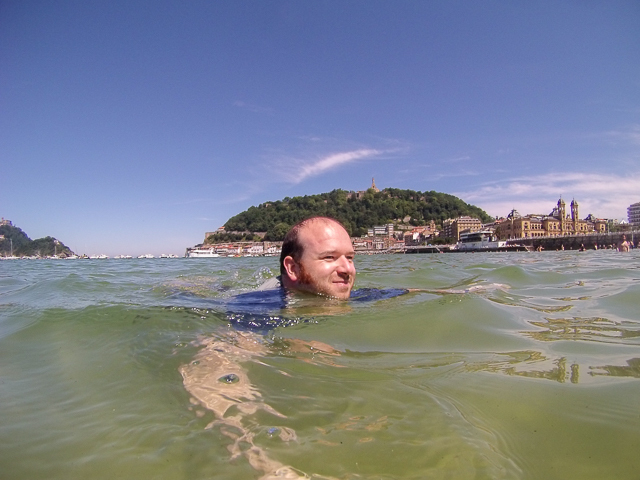 This entry was posted in Travel and tagged Photo, San Sebastian, Spain by Lewis. Bookmark the permalink.